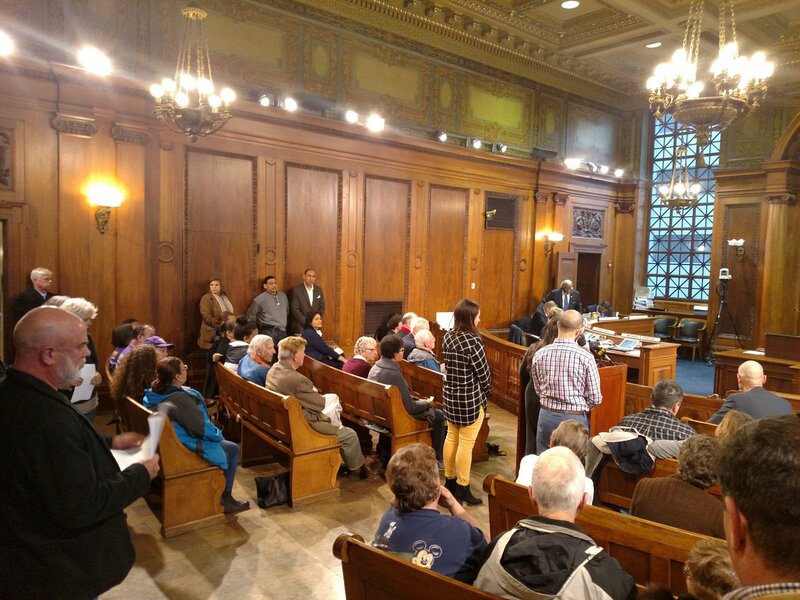 SPRINGFIELD—On Monday night, the City Council delivered a blow to Mayor Domenic Sarno’s efforts to bully a church out of shelting an undocumented woman. The body unanimously passed an order to halt expenditure of city funds to interfere with South Congregational Church’s provision of sanctuary to Gisella Collazo. The order was only one of several meaty issues before councilors that night. From marijuana retail taxes to the seemingly interminable saga over the district fire chiefs contract, the meeting stretched on for nearly four hours. Still, the order dominated the agenda. Facing a packed chamber, passed appeared assured, but the unanimity was a welcome plus. Speakers from the community, the League of Women Voters, and South Congregational itself addressed the Council beforehand to urge passage of the order. “In my opinion the approach is using a sledgehammer on a very sensitive matter,” Victor Davila, a 2017 council candidate said. League of Women Voters Springfield convener Linda Matys O’Connell noted the LWV’s generally pro-immigrant stance. She also alluded to Sarno without mentioning him. “As a matter of good government, the League opposes the use of the mechanisms of city government to pursue the personal political agenda of any city official,” O’Connell said. Former city councilor William Foley worried the order, as written, could penalize city workers doing their jobs. “I urge you to keep this discussion where it belongs between the mayor & the city council,” Foley told his former colleagues. Rev. Tom Gerstenlauer, the lead minister for South Congregational quoted Emma Lazarus’ “The New Colossus” and Christ’s description of the Sheep and the Goats. Some councilors later offered their own invocations of the almighty. “But I asked what would Jesus do?” Ward 5 Councilor Marcus Williams, asked. “He would not turn his eye or love from a stranger,” Williams added, needling leaders who lacked empathy. Ward 1 Councilor Adam Gomez reached for to the Torah to summon the command to welcome the immigrant and the stranger. “Any immigrant who lives with you must be treated as if they were one of your citizens,” he said, quoting Leviticus, which goes on to compare immigrants to when the Israelites were in Egypt. Gomez also condemned insinuations, rampant on social media—some have appeared on WMassP&I’s Facebook page—that Collazo and other undocumented immigrants were criminals, dangerous or freeloaders. Rather he noted that people like Colazzo were working and got gummed up by the citizenship process. “Nobody in this coalition is in favor of protecting and have has protected of somebody who has been convicted of drug charges, convicted of violent acts,” Gomez added. By Monday night, inspections Sarno ordered had already found but the least of violations. Councilors still sought the order, however, to head off Sarno’s prior threat to void South Congregational’s tax exempt status. Ward 2 Councilor Michael Fenton reminded the chamber of that point Monday night. Sarno has ignored press outlets’ inquiries into whether he was still interested in doing that. Despite seemingly lowered urgency, the order was attracting support, not losing it. Ward 6 Councilor Ken Shea, whom The Republican said opposed the order, said he had been mischaracterized. Rather, he simply shared Foley’s concerns and moved to amend the order to reflect that. At-large councilors Thomas Ashe and Kateri Walsh echoed Shea. Shea’s amendments were adopted by voice vote and the order passed 13-0. The Council recessed briefly as the large crowd cheered and slowly filed out. Once the meeting resumed, committee reports were read. Ward 3 Councilor Melvin Edwards, chair of the General Government, said his committee would continue reviewing the chief diversity officer ordinance. Ryan, chair of Finance, favorably reported the $100,000 contribution to the city’s marketing campaign. It passed unanimously. The district fire chief’s contract was not so lucky. A recurring issue for nearly two years, it went to committee on a 7-6 vote. Ward 4 Councilor E. Henry Twiggs, who has supported the contract before, backed the referral. At-large Councilor Justin Hurst said the Council should wait until a court rules in a related lawsuit. Another item that absorbed a lot of oxygen was a special act to allow the city to hire back retired police officers strictly for road construction duty. Deputy Chief Cheryl Claprood explained the department lacked enough cops to make them available for construction details around the city. The special act, if approved by the legislature, would allow Springfield to hire officers who had retired in the last five years. Other than a training refresher course, those hiring the detail would pay their compensation. Claprood explained civilian flaggers were not a practical substitute due to language in the patrolmen’s contract. Hurst, however, raised concerns about the hiring process. He moved to send the item to committee. Claprood and other department preferred immediate action, mostly to get the ball rolling in the legislature. Beacon Hill’s formal session does not end until July 31. However, Springfield’s home rule bill would need to face committee scrutiny first. Hurst’s argument ultimately won the day, 7-6. Councilors Edwards, Gomez, Hurst, Jesse Lederman, Ramos, Twiggs, and Williams voted to send to committee. Utility reports received acceptance, but a valet parking proposal for One Financial Plaza and a fiber optic installation went committee. Another proposal related to denying licenses to entities in arrears on taxes also went to committee. The Council accepted grants for libraries and street construction. After some debate and a failed Committee vote, the Council approved the maximum 3% sales tax for retail marijuana sales. The vote was 12-1 with only Walsh in dissent. Retail marijuana shops are not expected to open until the Fall when city writes zoning rules should be ready. The Council approved takings and funding for a reconstruction project at the eponymous intersection in the Six Corners neighborhood. Also approved unanimously were bonds of $875,000 and $2.4 million for police vehicles and South End Middle School renovations respectively. Councilor Fenton introduced an ordinance to regulate signs and stickers placed on city poles and streetlights. There was some chatter about his expansiveness but Fenton said the intent was to empower officials to stop the worst offenders. The ordinance passed first step. After declining to take up items in committee, the Council voted for a resolution asking the Massachusetts legislature reverse cuts planned for the Pioneer Valley Transit Authority. Based upon Governor Charlie Baker’s budget, the PVTA faces cuts and fare increases. Councilor Lederman noted that because Springfield enjoys the most routes, the city would take the brunt of service cuts. The resolution specifically calls for the PVTA’s line item to rise to $88 million from Baker’s proposed $80.8 to avoid the cuts. The resolution passed on a voice vote. Later in the week, the House unveiled its budget, which included Baker’s PVTA figures. Unless amended on the floor, attention will turn to the Senate to avoid the service cuts. As of this posting, Mayor Sarno had not announced a veto of the South Congregational order. It may pass into law without his signature. However, the Council’s Monday meeting became another page in the body’s furtive, but rolling journey to assert authority over city government. Whatever one’s position on immigration, the mayor’s action was an overreach, and the Council made clear that was unacceptable. In doing so, councilors also clarified not all power in Springfield flows from the executive.